A good looking car no doubt. As a package it presents a strong case for itself. Definitely overpriced and under powered but it has exclusivity going on for itself. A good read. However, it is a case of once bitten always shy when it comes to automobiles. Had the first gen Superb v6 from the earlier lot that was bought into India. The car gave us so much trouble we now dont touch a Skoda with a barge pole. The new Superb is a brilliant looking car and this one follows suit. However, the burn caused during the initial years by the brand is still enough for me to admire it and move on. Last edited by bigron : 27th December 2017 at 13:56. Nice review, Skoda's classier designs and their attention to detail is impressive. This is a beautiful vehicle to look at. Their designs are more impressive than VWs. I have been tempted by their designs but the after sales horror stories put those thoughts away. Incredible products indeed from Skoda. I did see one in the flesh at a Skoda showroom recently and my instant impression was that unless the +2 seats are a MUST have, the Tiguan is better value. The middle row in the Tiguan is slightly more comfortable on underthigh (although perhaps the Kodiaq might trump it for 3 abreast space not sure). Overall it'll have slightly better interior space in a slightly more compact external footprint - all that at maybe 4-5 lakhs less money. Will be interesting to see this segment fight it out further once the next gen 7 seat diesel CR-V hits our shores next year (hopefully). After reading this review of the Skoda Kodiaq, I am convinced that we made a big mistake by buying the Mercedes GLC 220d Sport. The Kodiaq has more features and space than the Merc any day at it's price. Absolute value for money. Imagine a 65 lakh rupee car like the GLC not having an interior boot opener button, no boot opening option on the key fob and no maps!!! There is no doubt that they make wonderful cars. Skoda now needs to invest time in promoting brand Skoda as well which has taken a hit in recent times due to various reasons. Change your attitude and your fortune will also change Skoda. A meticulous review, thank you for all the hard work. I simply love VW & Skoda cars for what they offer for the money. They are blessing for people like me who can't make peace with the cars of non-European brands who cut corners at several places & can't spend lavishly for premium badges. Being a Skoda fan and a loyal customer, this car has been on my radar for a while now and is the number 1 contender when the time comes to add a SUV to the garage. With the government's ever changing and tough stand on the future of diesels, it is absolutely critical that Skoda launches this fantastic vehicle with a competent petrol motor as well. Would widen the appeal a lot more in my opinion. I wait! Wonderful review! Despite all the bad press Skoda receive (mostly for right reasons) it’s good to see them bringing up compelling products to Indian market. Coming to the car, on the first glance it definitely looks over-priced. But that wouldn’t have been the case if they had a base variant announced (don’t even need to produce/sell that variant) with a starting price of 25-26 lakhs. If looked closer, I think the price is quite justified; ignore the badge and a car with similar feature set (and two seats less) from a luxury brand will easily cost 55 lakhs+ ex-showroom (Audi Q5, Merc GLC, Volvo XC60 etc.). Or in other words, this cost only as much as an Audi Q3 or Merc GLA – definitely more car and features for your money. 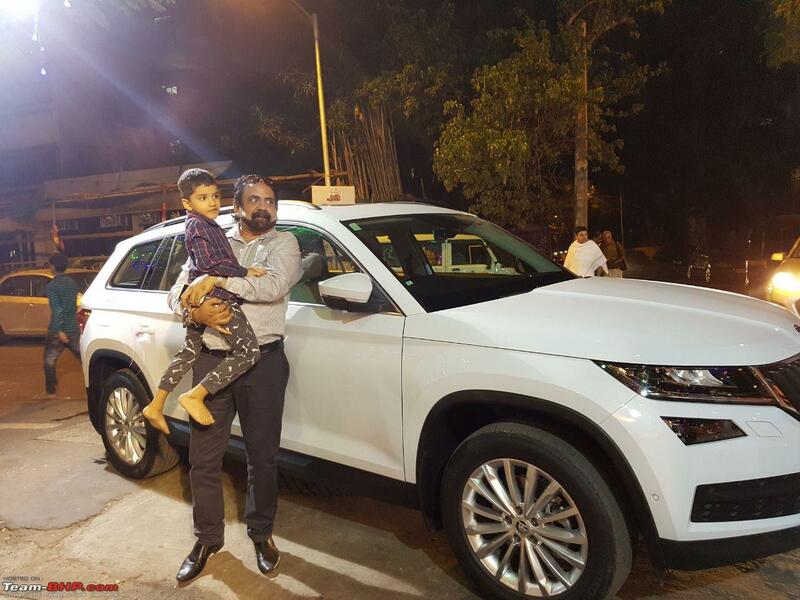 Got ours delivered on the 18th December (10 days from booking it) by JMD Thane. Absolutely love it except for the fact that they didn't offer choice of interior colors and only in one trim. We really wanted the Lava Blue color option but they said that only 5% of the total lot would be in Lava Blue and we couldn't wait 3 months for it. Last edited by R32_GTR : 27th December 2017 at 16:11. That took some time for me to finish. A brilliant write up coupled with detailed photos. All their latest cars are so good looking and loaded with features. I remember going when I saw the rear seat of the Superb. They definitely need to get things around to make an impact. An acquaintance recently bought the new gen superb and in a week it started showing all sorts of error codes in the HU. The car had to be towed to the service center. This can happen to any car but a good after sales support matters the most. That didn't happen in this case. Coming back to the car, it's a brilliant one. 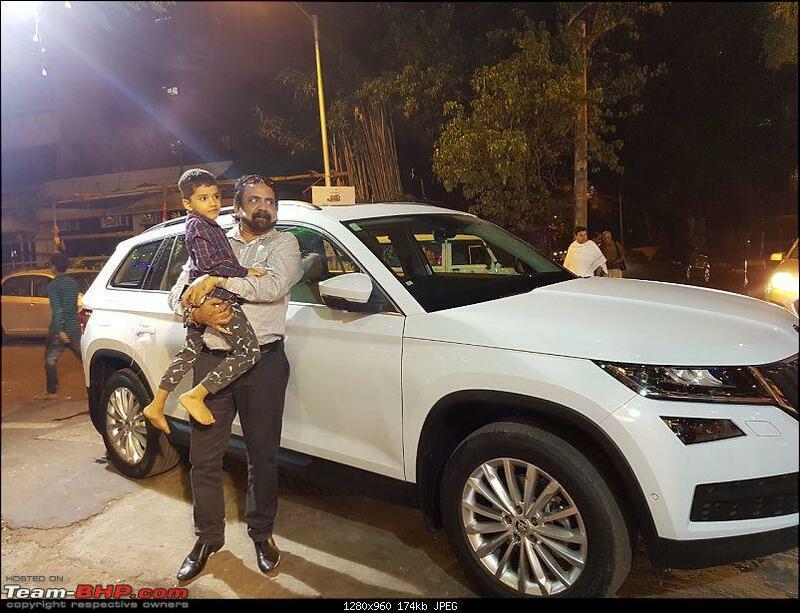 My uncle loved the car but the price was a disappointment (he's been looking to change his car for sometime now). Or in other words, this cost only as much as an Audi Q3 or Merc GLA – definitely more car and features for your money. Absolutely. Like I said, I was when I saw the Superb. But since this is priced close to the 3 main German luxury brands, people tend to go with them. I feel customers who buy this are the ones who appreciate the car and not look at the "badge". Indeed a 5 Star review, all the details mentioned are beyond the imagination of any Auto Mag. As mentioned by GTO, Its overpriced and underpowered. Hope SKODA gets a price revision on the lower side or plonks the bigger engine to make it more customer friendly. Will wait for further reviews prior to deciding between Endeavour or Kodiaq as a replacement for my A4. Couldn't agree more! This is what the old man said to me as well and that's all the assurance that was needed for my sis and I to get him what he wanted. The other German options in this price range aren't close in terms of what the Kodiaq offers - It was actually a no-brainer for us because of the highlighted line above. What an awesome review guys. As more and more tech gets added to cars, the Mods have a tougher job to do, to ensure nothing gets missed out, and nothing gets mentioned too much. Superb work, Hats off you guys. While currently I cannot even afford this cars wheels, I am simply in love with the timeless design, those straight line go straight into the mind. I never really understood the fuss about VAG cars until I drove one for a long duration. Could clearly understand why ones a VAG owner, it becomes difficult to hop brands. The solidity and premium feeling these cars evoke, makes the moolah spent worth it. Once again, a super awesome detailed review. Kodiaq definitely seems to be overpriced with the current tune provided by Skoda. It should have been launched with similar engine they have in Superb. BTW I am not impressed with the looks of either of them(Read: Tiguan & Kodiaq). SUV should possess the butch and brawny looks combined with rugged construction and good off-road capabilities. I will any day pick a Fortuner or Endeavour if looking out for a SUV and an equally competent Sedan(Octavia VRs, Passat, Superb) if I want the best driving dynamics in this price range.